Westminster Endowment Group Family Picnic July 28th! - Yo! Venice! Home Abbot Kinney Blvd Westminster Endowment Group Family Picnic July 28th! Westminster Endowment Group Family Picnic July 28th! 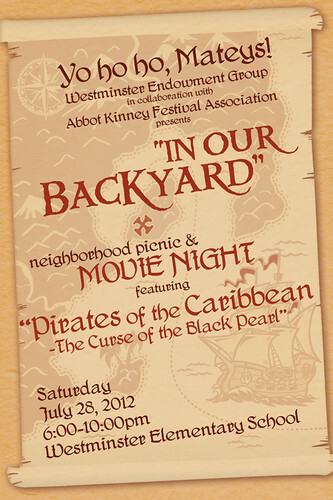 The Westminster Endowment Group in collaboration with Abbot Kinney Festival Associaton will host the “In Our Backyard” neighborhood picnic and movie night featuring “Pirates of the Caribbean – The Curse of the Black Pearl” on Saturday, July 28th from 6-10 pm. Proceeds from the event will benefit Westminster Endowment ST Math Program and the Abbot Kinney Festival Association Community Grants Program! Bring your blanket, wear your favorite pirate costume and enjoy the movie! There will also be a slide and pirate bouncy house, face painting, Pirate Costume Contest (Kids & adult categories), popcorn & treats, craft activies, select food trucks and grab bags (cost of $50, Value $75 or more! Only 50 bags available)!